and Rita Udina i Armengol (coordination). This article has been just published in both catalan and spanish in the conservation paper Unicum, which will be available online for free next year (or you can buy the printed version). Here we show a shortened version of the extended printed article, for non-spanish speakers. We will be publishing a video, soon, to show this new and revolutionary method. Silver mirroring is a type of deterioration that appears in most gelatin developing-out paper (DOP) historical photographs and black-and-white films. Its treatment involves so many problems that it has often been ruled out. In this article we present a new and simple elimination procedure, which is efficient and offers stable results in the long term. 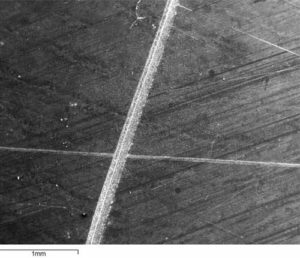 The study of the causes of the formation of silver mirroring sheds light on aspects that had been little explained so far: the fact that this type of deterioration always appears on the surface of the image leads us to consider a mechanism of transport of electrical charges. Silver mirroring can be found in many silver gelatin-based historical photographs, and black-and-white films. It is the by-product of certain degradation reactions of the photographic image. This by-product is composed of silver, which originally formed part of the image and eventually surfaces, by itself or in combination with other elements (Ag or Ag2S), generating an unwelcome reflective sheen that hinders the proper viewing and reproduction of photographs. The materials affected by silver mirroring are gelatin developing-out paper (DOP) black-and-white photographs, whose emulsion contains gelatin and silver. The silver grains that form the image are relatively large compared to those of printing-out paper (POP) photographs, which are much smaller. Silver gelatin photographs, including both positive and negative photographic images, can be found on all kinds of supports, mostly glass, plastic used in photography, and resin coated (RC) paper. It is therefore to be expected that these type of images constitute the majority in the collections of historical photographs: they comprise almost all black-and-white films, and over 90% of the black-and-white photographs of the twentieth century. The mechanism through which the silver that was once part of the image migrates to the surface has been explained, among others, by Feldman (1981), Hendriks (1984, 1991), Torigoe et al. (1984), Swan (1981), di Pietro (2004), and Nielsen-Lavedrine (1993). In short, all of them accept that the silver contained in the gelatin is oxidized by the action of an acid in the presence of humidity. Ag+ ions migrate to the surface where they are neutralized and finally deposited forming the metallic sheen that we call silver mirroring. 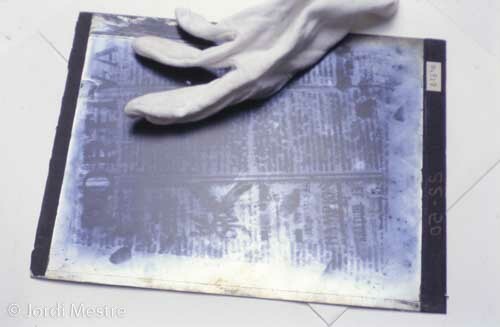 Most of the stains present in silver gelatin developing-out paper (DOP) photographs appear within the emulsion (inside). However, silver mirroring forms on the surface. Di Pietro (2004) demands Nielsen-Lavédrine a further clarification of “the driving force for the formation and/or aggregation of particles at the emulsion top surface” (1993). In any case, all authors mention the transfer of Ag+ ions. Thus, it seems clear that the electrostatic force is what drives Ag+ ions to the surface. Neutralization (whether by means of an electron or an S2- ion) happens on the surface and not within the gelatin layer. Therefore, silver mirroring appears as an external coating, which suggests that it might not be necessary to intervene the emulsion itself. If this coating is to be removed, that must be done without affecting the silver gelatin, where the image is contained. If such a procedure does not compromise long-term preservation, then we can say that we have found a proper method of elimination of silver mirroring. 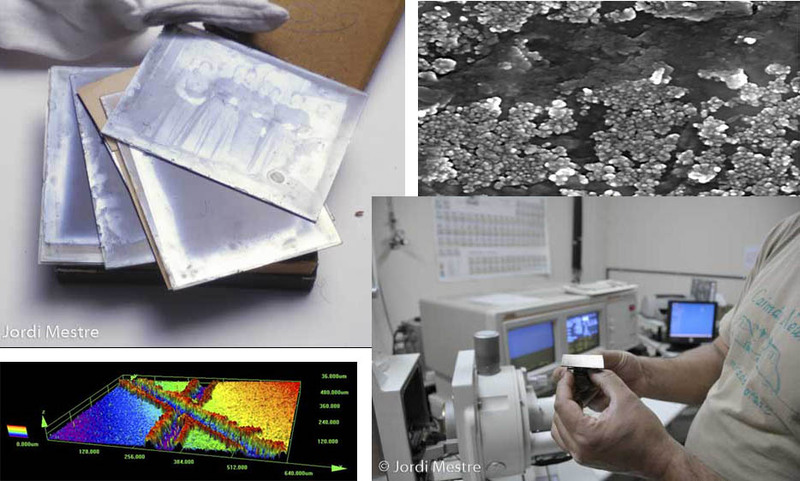 The procedure that we propose satisfies the requirement of not damaging the gelatin, and can improve long-term preservation conditions because it neutralizes residual acidity (which is what causes the transformation of silver into silver ions in the first place). Why Do We Want to Eliminate It? As for positive photographic images, it is obvious that a reflective, bright sheen covering what should be darkened silver distorts the image itself. In negatives, silver mirroring can appear covering the plate more or less uniformly, but sometimes it can also cover it unevenly. In the typical case of plates stored for long periods in their original box, we see that the top-most plate of the box presents a fairly regular pattern of silver mirroring, while in the rest of the plates silver mirroring appears only around the perimeter. This is due to the interaction with pollutants, which act completely unhindered on the upper negative while affecting only the edges of the rest. Other factors can also affect the localization of silver mirroring, such as in the case of plates wrapped in newspaper, where this effect only appears in spots covered with no printed letters, for ink inhibits acidity; fingermarks can also prevent its formation, for grease creates a protective layer and therefore silver mirroring only emerges in the ridges. If the silver mirroring pattern was perfectly uniform, it would simply form a filter that would hinder the transmission of light, but any kinds of discontinuities in the negative are later transferred to the positive. This includes frame patterns, printed letters, fingermarks, and any other irregularities that allow for a different transmission of light than that of the areas that do not present silver mirroring. Eliminating all silver mirroring would solve this problem and the resulting image quality would clearly be improved. The treatment of silver mirroring is often ruled out, mainly because the procedures used to date are clearly aggressive and can compromise—and even destroy—the integrity of the physico-chemical emulsion. 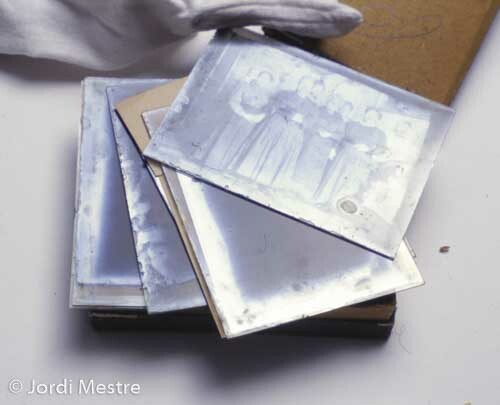 Acidity is actually detrimental to the preservation of these images, but silver mirroring by itself does not jeopardize the future stability of the image, because it is a sheen composed of silver or silver sulphide. Nevertheless, it is an unwelcome effect. However, certain procedures used to eliminate it can be quite devastating, hence the usual choice to avoid the elimination of this annoying excrescence. This has led us to look for a way to eliminate silver mirroring without damaging the emulsion. In this paper we propose a treatment method to eliminate silver mirroring from photographs on any of these supports: glass, paper, and plastic. It has the virtue of not damaging the photograph while improving its condition and future preservation, even in photographs that were less than stable to begin with. The methods suggested by Kodak in the book Conservation of Photographs (F40) and those gathered by Bertrand Lavédrine in La Conservation des Photographies, have in common the use of non-proportional reducers and some kind of aqueous phase, among others, for a long wash.
Kodak’s method in F40 consists in the application of a reducer composed of ammonia and thiourea dissolved in phosphoric acid, followed by a long wash in clean water. Lavédrine compiles two methods. The first one consists in a bath of iodinated absolute alcohol followed by the elimination of the resulting silver iodide with a fixer, which must be removed by means of a prolonged aqueous wash. The second method is based on a reducer made of ammonium thiosulphate, which must be neutralized and thoroughly washed with water. According to F40, the treatment must be stopped in case of detachment of the gelatin. 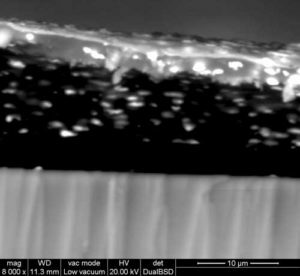 Reproducing this method on emulsioned glass plates, we have observed this detachment, which does not recede when the process is interrupted, thus causing severe damage. In fact, the detachment was to be expected because we have, on the one hand, a glass with almost absolute dimensional stability, and, on the other, a gelatin suffering a series of important dimensional oscillations. In the case of historical photographs, the emulsion has undergone repeated dimensional changes through the years, while the glass has suffered practically no changes. Therefore, the adhesion of the emulsion to the glass has been more or less reduced. When the gelatin gets wet it swells, and it suffers even higher dimensional changes during baths, due to the transition from a very acidic solution (pH 4.7, its isoelectric point) to a basic solution, thus transitioning from an expanded to a much less expanded state. The drying of the gelatin leads to further shrinkage. 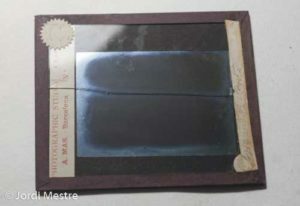 Such drastic tests have a high probability of causing the gelatin in historical materials to detach, especially in the case of glass plates (as it is more dimensionally stable than plastic). Stopping the intervention when the emulsion starts to detach, as Kodak and Lavédrine suggest, only prevents further damage, but does not restore the piece to its prior condition. Therefore, the methods for the elimination of silver mirroring that include an aqueous phase at some point, swell the gelatin excessively and their application to historical materials should be ruled out, especially when the support is glass. We used fragments of silver gelatin developing-out paper (DOP) glass plates from the 1920s, which presented extensive silver mirroring. They also presented scratches of various depths and ages. First, dust must be removed with a fine brush. 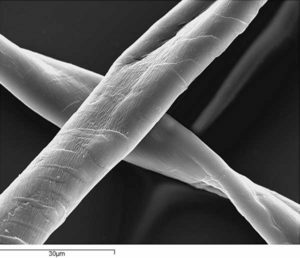 A cotton swab impregnated with tetrachloroethylene and a small amount of calcium carbonate is applied to the image layer in circular motions. A few minutes are allowed for the solution to neutralize the eventual acidity of the emulsion. The subsequent removal of the calcium carbonate with another swab with tetrachloroethylene, also eliminates silver mirroring, leaving the gelatin intact. At the same time, most of the mould is also eliminated and the effect of old fingermarks is also significantly reduced. Negative glass plate with silver mirroring before treatment (left) and during treatment (right) (only top side is done). Various chlorinated hydrocarbons have been commonly used to clean photographic gelatin, especially to remove grease, fingermarks and mould. The main virtue of chlorinated hydrocarbons is that they do not hydrate the gelatin and therefore do not destabilize it. Currently, the most commonly used is tetrachloroethylene, due to its low toxicity and its efficient production process. Trichloroethylene or tetrachloroethylene dry out the photograph less than alcohol, eliminate grease and mould, and, along with the carbonate and the cotton swab, serve as the means to easily eliminate silver mirroring without swelling the gelatin, and therefore without risking detachment. It can even be applied to the photographs that are glued to some sort of support, which can not be said for any water-based method. Calcium carbonate has many virtues. It is inert until it meets an acid, which it neutralizes, hence its frequent use as an alkaline load. Its very soft particles do not produce scratches. It can be easily crushed, and therefore sweeps surfaces instead of polishing them. If some residue is left, it is even beneficial to protect against acidity. The treatment of silver mirroring through dry alkaline neutralization enhances even the state of conservation of the photograph. 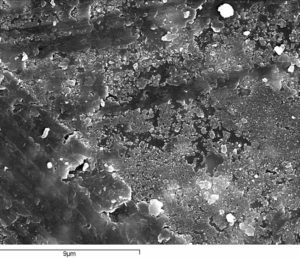 The observation of the formation process of silver mirroring on gelatin allows us to see that it first appears in the form of thin grains—with respect to the silver grains of the emulsion—grouped together in larger aggregates. When silver mirroring spreads, the small grains combine to form a sort of crust. In the areas where there has been some fine abrasion, silver mirroring has been coincidentally eliminated along the scratch, which uncovers the naked image, consisting of gelatin and silver grains. The observation of a cross section shows, from bottom to top: glass, the emulsion, and the top sheen of silver, migrated from its original position to form the silver mirroring. On the gelatin of the photographic plate affected by silver mirroring, we made two deliberate crossing scratches with a knife that reached the glass. 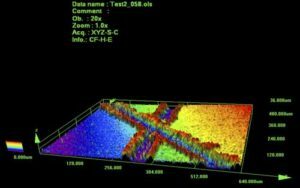 The confocal laser microscope showed us the marks with their corresponding rims and the particles loosened by cutting the emulsion. We then applied the calcium carbonate with the tetrachloroethylene-impregnated swab. 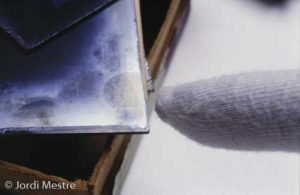 The elimination of the silver mirroring also removed the loose gelatin particles but did not shave off the rim of the cut, which shows that the cleaning process does not compromise the gelatin. Since carbonate is much softer than dry gelatin, it only sweeps away surface particles—such as silver-mirroring particles, gelatin remains, and the eventual mould or dirt—without altering the gelatin still bound to the support that acts as a barrier against lime. 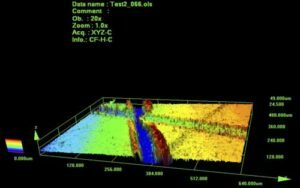 The proposed method uses chlorinated hydrocarbons, which are very efficient for this kind of treatment. Their use should be moderate because of their toxicity, but it is fully justified in this professional field with the appropriate safety measures. We would like to mention the appearance of tiny marks of less than 2 microns that we have attributed to the action of the siliceous particles contained in cotton fibers. Other systems can be implemented in the future but, in fact, 2 microns is too small an effect to be considered actual damage. Precautionary preservation must be the priority measure, because, if appropriately carried out, it will prevent the formation of silver mirroring, and with it the need for its elimination. 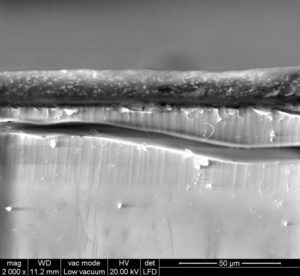 Acidity and humidity are responsible for the formation of silver mirroring, and electrical charges are the cause for its appearance on the surface. Aqueous or humid methods to eliminate silver mirroring must be avoided, for they are excessively risky and adventurous. The use of calcium carbonate and tetrachloroethylene is efficient, secure, and improves the future stability of photographic images. However, further studies are still needed. 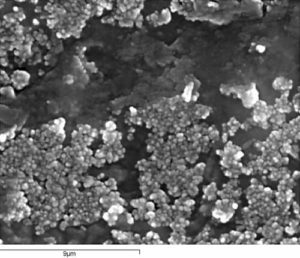 The results of the cleaning process and its possible unwanted effects on the photographic support were monitored using an environmental scanning electron microscope (ESEM) FEI Quanta 600, equipped with EDX-EXL II system Link Analytical Oxford, a confocal laser microscope and an ESM (Environmental Scanning Microscope). Bitelli Masetti, Luisa; Vlahov, Riccardo. : La fotografia. 1. Techniche di conservazione e problemi di restauro. Edizioni Analisi (ed.). Glafkidès, Pierre. 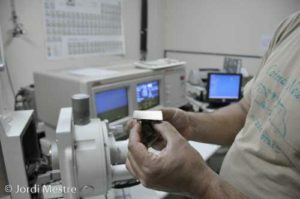 : Química Fotográfica. Ediciones Omega (ed.) 1953. Hendriks, Klaus B.: Preservación y restauración de materiales fotográficos en archivos y bibliotecas: un estudio del RAMP con directrices. Organización de la Naciones Unidas para la Educación la Ciencia y la Cultura. Paris 1984. PGI-84/WS/1. Hendriks, Klaus B. et al. : Fundamentals of Photograph Conservation: A Study Guide. National Archives of Canada (ed.). 1991. Hess Norris, Debra; Jae Gutierrez, Jennifer. : Issues in the conservation of photographs. The Getty Conservation Institute (ed.). 2010. Lavedrine, Bertrand. : La Conservation des Photographies. Presses du CNRS (ed.) 1990. Pages 59 to 62 and 136-137.
di Pietro, Giovanna. : Silver Mirroring on Silver Glass Negatives. Basel Universität (ed.). 2002.
di Pietro, Giovanna. 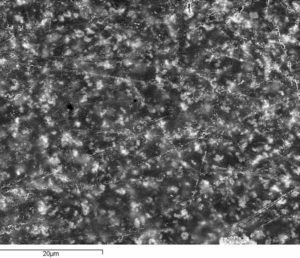 : A local microscopic model for the formation of silver mirroring on black and white photographs. National Museum of Australia Canberra ACT. 2004. ABN 70592297967 .